Make your LTE Call Now! LTE (long term evolution) is an advanced and complex technology that uses two different transmission schemes in the downlink and the uplink. LTE also specifies the support of different frequency bands, a subset of six bandwidths and different modes (FDD and TDD) – a challenge for chipset vendors and device manufacturers alike. In addition, the support of the multi-antenna technology known as MIMO (multiple input multiple output) is mandatory for LTE. All these features call for a lot of testing. Especially now, when the first devices are leaving the labs and are close to reaching a commercial stage, the focus is on RF testing for LTE. 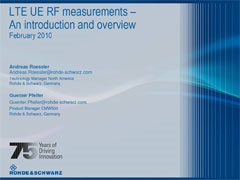 Our webinar shows which types of RF measurements have been defined for LTE-capable UE (user equipment), explains their meaning and describes how they can be performed using our R&S®CMW500 wideband radio communication tester – in connected mode of course.